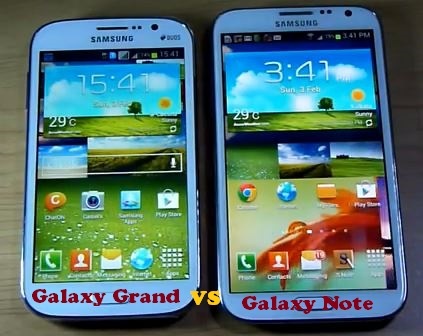 Samsung Galaxy Grand vs Samsung Galaxy Note is a very good comparison because of the slight difference between the 2 smart phones, there is a very slight difference in the features but a very huge price gap between the two. The Display size in Not is slightly bigger with better resolution, touch screen is different with Amoled in Note, A slightly better battery with higher back up is given in Note along with a 1.4 GHz processor compared to 1.2 of Grand. But there are some advantages of Grand compared to Note like the Dual sim feature, same camera, same RAM features give the Note a run for its money with a price difference of $200.